This 60 GHz ISM band Transmitter (Tx) and Receiver (Rx) Development System makes designing new high-bandwidth products and solutions easy. 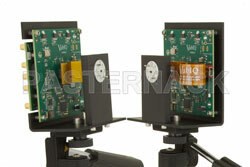 The 60 GHz transmitter and receiver development system contains user-friendly features that include: a Graphical User Interface (GUI) for configuration via USB and standard WR-15 V-band waveguide interfaces for external gain horn antennas. 802.11ad and 802.11aj WiFi / WiGig development is quick to set up with 1.8 GHz modulation bandwidth capability. Because the 60 GHz TX /RX system utilizes the globally-unlicensed ISM bands in the RF spectrum, the development kit can be used to develop a wide selection of product applications in the mmwave unlicensed frequency band covering 60GHz. Using the tools and components of the 60 GHz development kit, high-bandwidth data can be clearly transmitted at extreme high speeds for a variety of applications that may include wireless backhaul, wireless gigabit ethernet data communications, and wireless HD video. 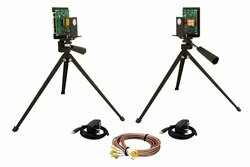 Pasternack’s PEM009-KIT Development System for 60 GHz offers improved phase noise performance from the internal reference clock oscillator that results in a higher resolution Transmit (Tx) and Receive (Rx) signal carrier response.